Configuring and securing a device for corporate use requires know-how and time that most employees just don’t have. Let us help you simplify. 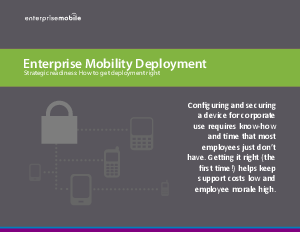 Our Enterprise Mobility Deployment solution brief details the issues that need to be considered before you begin to deploy and how to solve the problems they can present. Getting it right (the first time!) helps keep support costs low and employee morale high.